Provide comfort for the family of Kathleen Sheets with a meaningful gesture of sympathy. 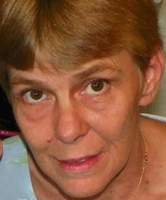 Kathleen “Kathy” Ellen Sheets, 57, passed away peacefully in her home on February 1, 2019. She was born September 18, 1961 in Bradford, Pennsylvania to Charles and Hazel Cox and grew up in northeast Oklahoma. Kathy was preceded in death by her husband, Boyd Sheets, her father and mother, and daughter Melissa. She leaves behind her son, Samuel (Stephanie) Webb and daughter Stacey Weaver, grandchildren, four brothers and four sisters. To send flowers in memory of Kathleen E Sheets (Cox), please visit our Heartfelt Sympathies Store. Provide comfort for the family of Kathleen E Sheets (Cox) by sending flowers. I wanted to bring some comfort to the family that the bible gives when we lose one's, 2Corintians 1:3,4 . The God of comfort .. "There is going to be a resurrection" Acts 24:15 .. Comfort when loved ones die= 2Corinthians 1:3,4 Freedom from a morbid fear of death= Hebrews 2:15 , A real hope of being reunited with your dead loved ones ..John 5:28,29 ..My prayers for the family ..
Condolences to Kathy's family. She was a sister-in-law by marriage. But a sister in my heart. Stacey I love you. And I'm so sorry for your loss. To the family of Kathy Sheets sending my love and deepest condolences to you. RIP my dear friend I will miss you. May the family of Kathleen E Sheets please accept my sincere condolences hoping you find comfort in God's words at Acts 24:15 and Psalm 37:29. Kathy with some of her grandkids; Aliyah, Jordan, and Bayliann.